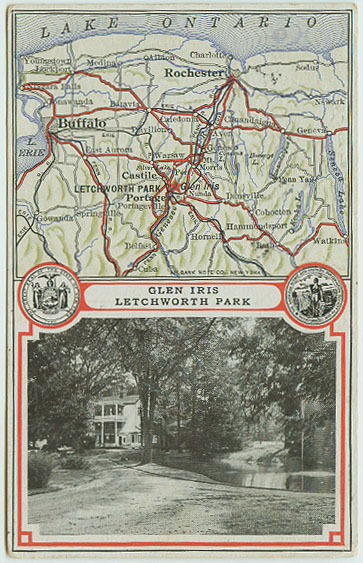 "Best Automobile Routes to Glen Iris- Letchworth Park"
Letchworth Park was only about a decade old when this postcard was published. It bears the seal of New York State and the American Scenic and Historic Preservation Society who jointly oversaw the Park until 1930. The postcard was postmarked September 10, 1918. The Glen Iris opened as an inn in 1914 and quickly became a popular dining spot. Postcard advertising was at its height, and this series of cards with the map and some park scenes was published. A close up of the map is shown below. You will note that the main drive through the Park today did not exist- the northern boundary of Letchworth Park did not reach much farther north than the Big Bend area at this time. 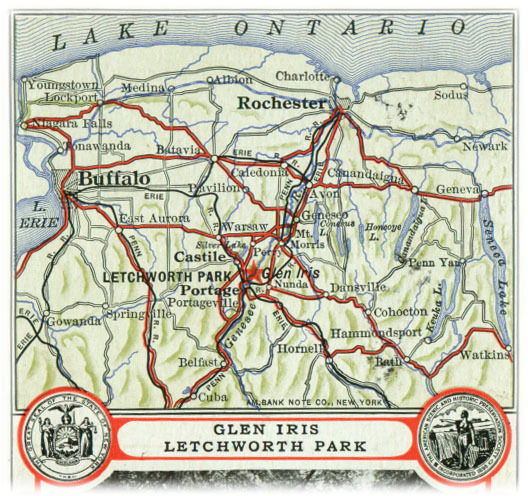 A generation before this postcard was made, the railroad was the main way to reach the Mr. Letchworth's Glen Iris Estate. See Image 156 for detail of the Glen Iris "Mystery Photograph"